We eat a lot of shrimp at my house...served any number of ways. My favorite is Shrimp De Johne, but we decided to try this scampi recipe recently. A simple dish, full of flavor. I served it with roasted carrots and you could also serve the shrimp over rice or pasta. 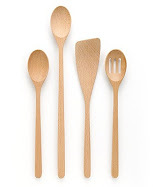 Mash garlic to a paste with 1/4 teaspoon salt using a mortar and pestle (or mince and mash garlic with salt using a large knife), then stir together with fresh and dried herbs, shallot, onion, 1 1/2 sticks (3/4 cup) butter, 1 cup bread crumbs, nutmeg, mace, 3/4 teaspoon salt, and 1/4 teaspoon pepper. That looks so good! A lovely recipe. Hi Barbara, this is one of my favorite ways to enjoy shrimp, love all the herbs that you added, looks wonderful! That looks so inviting! I love shrimp and that golden crumble makes it even more irresistible! I want to visit your house--I love shrimp! The crispy, garlicky breadcrumbs sound so good. Wishing this was on the menu for dinner tonight. There is something about garlic and shrimp that are a perfect match. I make a shrimp scampi with pasta but love the golden crust on this recipe! Love NYT recipes! Wow so many beautiful seafood dishes this week. Positively inspiring Barbara! Love this recipe. We are in Florida now and for some reason we eat more seafood when we are here. Thanks Barbara. 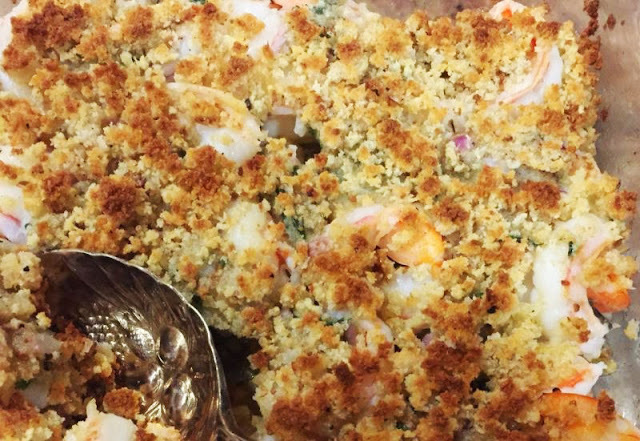 Your scampi coated with its breadcrumb topping sounds great. My MIL used to make something similar and I haven't thought about it in years.